You the heroes must band together to drive them back. To do this, you will need powerful spells, skills, attacks and loot. When the game begins, you are a basic hero; you can explore and fight. Lucky for you, this is a deckbuilding game! You can buy new cards to add to your deck - cards which will define you as an adventurer and complement the strengths of your fellow heroes. 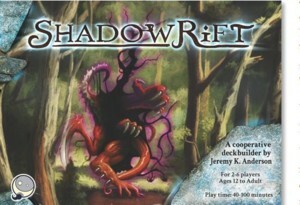 Shadowrift is a cooperative deck construction game. Each player has his own deck, representing his heroic skills and abilities, but all of them are using those abilities to work as a team and fight off a horde of slavering fiends that want to burn down a town. If the town burns down, catches plague, or explodes, the heroes lose. If the heroes are able to fight off the monsters long enough to construct defenses for the town, or if they venture into the dark and seal the Shadowrifts with powerful spells, they win.